Following Mark Kirkpatrick's graduation from High School he served in the 82nd Airborne and later Graduated from University of Tennessee, Knoxville. Mark is descended on both sides of his family from Tennessee and Pennsylvania Pioneers that served in the Revolutionary War. Mark says this was drilled into him, with a solid work ethic, by his parents. Mark moved east to the Mountains of North Carolina to be close to the Mountains and to build fine homes. After working for a number of builders, both commercial and residential, for many years, Mark became a Licensed Contractor in North Carolina in 1985 and, when building opportunities developed in Tennessee, he acquired a Tennessee License. Mark H. Kirkpatrick, founded Mountain Construction in Banner Elk, NC in 1985 with the intent to Build The Best, most creative homes and to build a market for fine, well designed, super sealed and insulated Timber Frame Homes that manifest the feel of the Southern Mountains and the Big Woods we live in. Building on Mark's construction talents, Mountain Construction was the first Timber Frame company in the high country. Mark site cut a half a dozen Timber Frames with his talented crews. He site cut with his crew the first timber frames in Banner Elk, Boone and Blowing Rock. A former Blowing Rock Building inspector said "your framing is nicer than most builders trim." 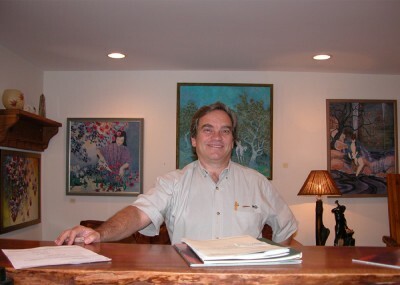 In 1992 after educating himself with the Timber Frame and Hybrid Home design skills of Hearthstone Homes, while building a comfort margin with their staff, their broad ranging skills and vision, Mark became a regional distributor for Hearthstone. Mark says, "Bring us your ideas and we will turn them into reality." Mark has been selected by many for his creativity, solid management skills and the integrity that he manifests. He has worked for five general contractors and two architects from "off the mountain," building their own personal 2nd homes. One of the architects said "We have talked to a number of people and know, going in, that we will get exactly what we want and we look forward to working with you." Mark has also worked for accountants, doctors, developers, real estate agents, and many other professional clients. We take pride in our work, along with our clients. Mark has worked for many appreciative clients for years and has designed a good deal of what he has built. Mark and Mountain Construction have had many great opportunities and worked for many great clients and friends. In 2004, we were building a number of particularly creative homes. We copyrighted one of our catchphrases, "Building Art You Can Live In." Mark's wife, Debbie Arnold, is and accomplished artist in her own right. You can view some of her work at www.arnoldfineart.com. Read an interview with Mark Kirkpatrick.